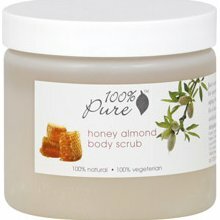 Juicy and invigorating body scrub smoothes away bumps and flakes for incredibly silky soft skin. Fruit oils deeply moisturize while anti-aging vitamins and antioxidants nourish. Fruit acids brighten gently for a healthy glow. No harsh detergents, no synthetic chemicals, no artificial fragrances or any other toxins that can strip, irritate or dehydrate your delicate skin. Truly, 100% Pure.